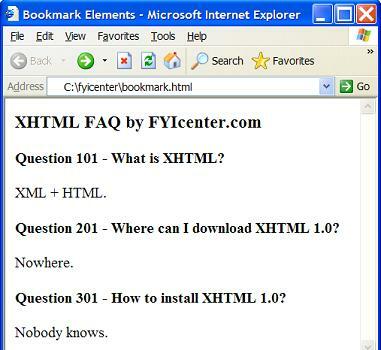 A bookmark is a named reference point in an HTML document. If a bookmark can be included in the URL that represents this document, the browser will automatically move the display window to the reference point as soon as the document is open. An "a" element with the "name" attribute defines a bookmark. The "name" attribute is used to specify a name for this reference point. The content of the "a" element could be empty. The content of the "a" element will be display normally by most browsers. This makes a bookmark invisible.